If you're running low on cash and find yourself having to give cheap cheerleading gifts, make sure you make them thoughtful. Think about the needs or wants of your favorite cheerleader, and give a gift personalized for her. Cheerleading trinkets are one option for showing the cheerleader in your life that you love her, and trinkets don't have to cost very much. But if you think about the cheering lifestyle, you know that cheerleaders juggle a life of intense physical activity with the need to stay well-groomed. Choosing cheap cheerleading gifts that facilitate this lifestyle is both thoughtful and practical. A number of cheering websites offer cheerleading key chains for prices ranging from $4.00 to $20.00. For a minimal fee, sites like A Little Spirit will personalize the keychains with the cheerleader's name. Give cheerleader ornaments for seasonal decoration or to hang year-round from a bulletin board or athletic locker. You can also look for mini-ornaments to decorate megaphones with. You can find inexpensive ornaments for under $10.00. Many stores, like Chalktalk Sports, offer necklaces, bracelets and charms specifically for cheerleading and spirit. Choose from charms of megaphones or pompoms, or go for a simple word like "cheer" or "believe." You can easily find a charm or necklace for under $20.00. If your favorite cheerleader is in high school, she may want to deck out her car with a cheering decal. Go for the basic bumper sticker, or choose the personalized decals you stick to the windows. The personalization costs a little more, but you can still pick one up for around $15.00. Perfect for a teammate, pick up an inexpensive wood picture frame and decorate the outside with paint, glitter, and other knick knacks to bring to mind all the fun you have as a team. Choose a larger frame and make a collage of photos, or stick to a single-picture frame for an action shot of the cheerleader in question. The frame and supplies might cost between $5.00 and $15.00. If you want to give a memorable gift to your daughter, opt for the more intensive scrapbook that chronicles the adventures of your cheerleader. Fill it with photos from the course of her career and decorate with cheerleading scrapbook paper and stickers. You can keep scrapbooks simple and put them together for under $20.00, but keep your costs in check because all the paper and decorations can add up quickly. Pick up cheering T-shirts perfect for practices for prices ranging from $5.00-$20.00. Clips, headbands and ear warmers are practical gifts that will make your cheerleader look put-together while on the sidelines. Choose team colors or bands that say "cheer" across the top. Depending on the brand and type of hair wear you purchase, you could spend anywhere from a couple dollars to as much as $20.00. Nail PolishWhat girl doesn't love painting her nails? Give your cheerleader the gift of glam by giving her a number of colors and styles of nail polish. Team colors, glitter, top coats and nail stickers will make her stand out. Each polish may cost anywhere from a dollar to seven or eight. It's important for your cheerleader to smell good after practices and games. Give her travel body sprays, bath gels and a loofa to facilitate her beauty routine. Most bath sets cost under $20.00. If you can't cover the whole cost of a manicure, pedicure or spray tan, give your cheerleader a gift card to her favorite spa. Every girl loves a gift card, so she's sure to appreciate the thought. If you know you're not spending much on the present, jazz up the presentation a little to make the gift special. For instance, if you're giving an ornament or a charm, use clear cellophane to wrap up jellybeans in the team colors. 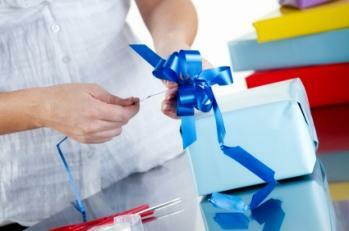 Use silver or gold curled ribbon to tie the cellophane up, then attach the ornament or charm to the outside of the gift. Even though cheerleaders may want all sorts of expensive cheer "stuff," when push comes to shove, they're in it for the sport, not the goodies. Any gift given from a loving and thoughtful heart makes a good gift.